The weekend is going to start warm and sunny, but in the next 24 hours the temperatures are going to drop like it’s winter all over again. 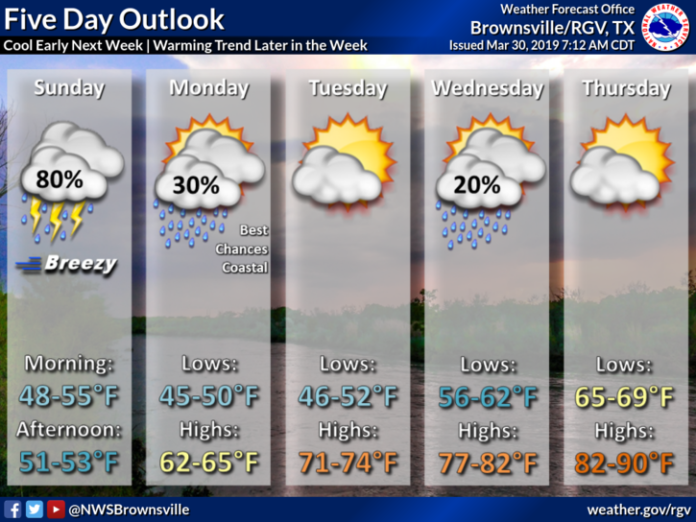 The National Weather Service in Brownsville says the final days of what it calls the “cool season”, October through March, will indeed be cold with temperatures today reaching the upper 80s and then falling to the low 50s by Sunday afternoon. Forecasters say the late season cold front will bring with it “feel like” temperatures in the upper 40s. There’s an 80 percent chance of rain with the possibility of up to two inches along the Rio Grande from Starr to Zapata counties and the rest of the Valley experiencing one to 1.5 inches of rain. Some localized flooding is possible along the areas parallel to Expressway 83. The storm will also be accompanied by high winds and rough seas, with gale force winds possible in the gulf. Forecasters may issue gale warnings later today because the seas offshore are expected to rise eight to 10 feet. If you’re headed to South Padre Island, consider getting your beach time in today because once the front arrives all the beaches along the coast are expected to experience intense rip currents, so swimmers are urged to follow the flag warning system. The front may also cause a problem for the pelicans along Highway 48 near the Bahia Grande on Sunday. If you’re traveling along that stretch of road be aware of the possibility the large birds may land on the highway. 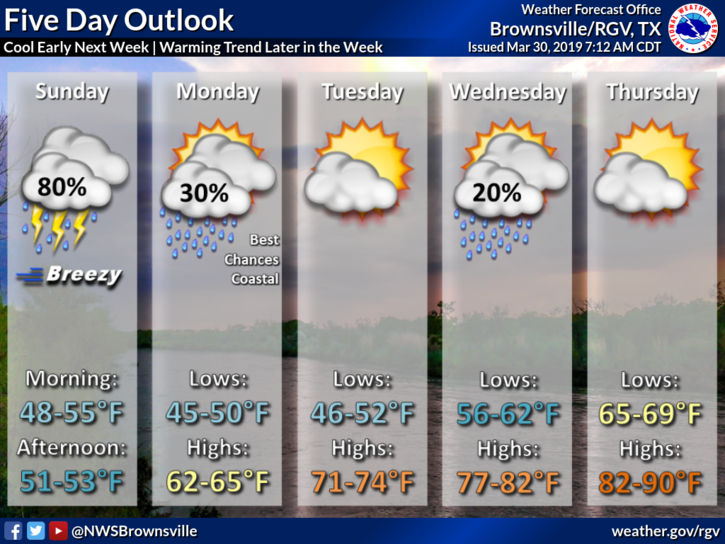 The cold air will remain through the first of next week with morning temperatures Monday and Tuesday expected to be in the mid 40s to low 50s and daytime temperatures in the 60s on Monday and low 70s on Tuesday. There’s a 30 percent chance of rain along the coast on Monday.